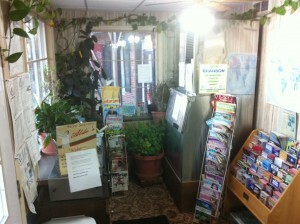 The office at the Rustic Motel contains tourism guides and maps, leisure reading and Vina’s plants. Being a mature business person who has managed small businesses and motel, I found your motel on “Mom and Pop Motels” for Sale. Would you mind just sharing 2 things? What are you asking for your motel, and when do you want to sell it? Or is it still for sale? Jenifer, thanks for your comment. Our motel is not for sale, however.